The symbolism that American car manufacturers exude has left them nothing short of iconic in the public eye. In Chevrolet’s case, one look at the legendary gold bowtie and it’s clear that you’re stepping inside a model that’s strong, durable, versatile and capable to handle any situation. It’s for this reason that the Chevrolet line – complete with high-performing pickups, sport utility vehicles and sedans – has become intertwined in the fabric of American culture. That’s also why our Apex Motorworks team is so proud to offer quality used Chevrolet models near Chicago IL! We pride ourselves on offering vehicles that are at home both on the road and the track, which is why it’s no surprise to see top Chevy models like the Corvette and Camaro represented in our inventory. Keep reading to see how you can get behind the wheel! From our Chevrolet inventory, our Corvette models represent the 1999 and 2016 model years, complete with the low-lying stances and serious V8 power that you’d expect from vehicles of its caliber. Our Corvette comes from the 1968 model year, its high-output V8 engine harkening back to a time where American muscle was at its peak. Any way you look at it, a Corvette or Camaro is a snapshot of sophistication and status, and one that if you can, you should definitely take a second look at. 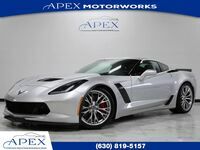 We should also mention that with our Apex Motorworks sales team by your side, you’re able to get credit approved in seconds for the Chevrolet model of your dreams. Applying on our website has no effect on your credit score, and once we get you qualified, we can also help you work out the right payment plan for your financial situation. Contact Apex Motorworks today and we’ll be happy to help you make all your automotive dreams come true!